For most homeowners, the master bedroom is one area where you spend a significant amount of time. It is also an area where potential buyers will pay particular attention and can make or break a sale. Luckily, you don’t have to spend a fortune to create the perfect master bedroom. Here are four budget-friendly tips to create a bedroom you — and all buyers — will adore. Bold and dark colors can create a dreary and gloomy area. It also makes the space look smaller and cramped. Decorate the room using light and neutral colors. Choose your paint colors wisely, along with your décor items. If you like a bold or dark color, use it as an accent color on your bedding set and pillows. Consider colors such as tans, light greys, light blues, and light yellows for your main color scheme. Items in the bedroom such as window coverings, light switches, plugs, etc., can make a room appear outdated and old. Instead of spending a fortune on one large bedroom update such as new carpet or an expansion, focus on the smaller details in the room. Install new window coverings, change the outlet covers and switch plates, etc. Even painting the trim around the door and the baseboards will make a difference. 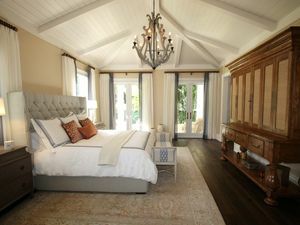 Installing new flooring in your master bedroom may be out of your budget. This one project can cost thousands of dollars depending on the type of flooring you choose to install. To save you some money and still provide an attractive floor for potential buyers, professionally clean the area. Have the carpets scrubbed and shampooed. If you have hardwood flooring, have scratches and dings repaired. The master bedroom is one area where you need — and want — ample lighting. Update any old lights with energy-efficient fixtures and install LED light bulbs. This will not only help you save a substantial amount of energy each month, but will provide a brighter area. Try to avoid extravagant and bizarre light fixtures as this will be just one more thing potential buyers will want to fix after they purchase the home. Once you have made your bedroom updates and are ready to place your home on the market, contact Collingwood real estate agent Christine Smith. She can help you attract potential buyers and sell your home quickly and at a price you like. Are you placing your Collingwood home on the market? If so, don't forget to complete these cleaning tasks before your first showing!